Students of Chicago's history, photographers and preservationists have been steeped in Richard Nickel's odes to the city and his memory. But the typical discussion about Nickel is only as a legend: the man who gave his life for architecture. Fortunately, Chicago-based City Files Press published its second book about the photographer and activist, Richard Nickel: Dangerous Years: What He Saw and What He Wrote. This book is a special opportunity to simultaneously experience Nickel's work and understand him as a person through more than 100 photographs and another 100 documents, many of them handwritten by Nickel. The Chicago-based architecture firm, VOA Associates, Inc., has been selected as the winner of a six-month architectural design competition, made possible by a grant from The Richard H. Driehaus Foundation. 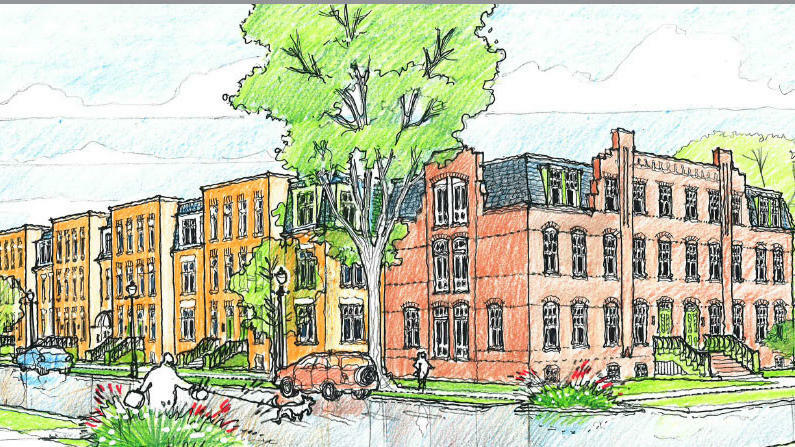 VOA Associates, Inc., will be designing the Pullman Artspace in the historic Pullman neighborhood, which will include 45 affordable live/work apartments, as well classrooms, an exhibition space, and workshops. Artspace Project Inc., has its headquarters in Minneapolis and offices in Los Angeles, New Orleans, New York, Seattle and Washington DC. By designing a creative space, VOA Associates hopes to achieve a sense of honor for the historical "character of Pullman's landmark community" and welcome those who are interested in a creative weaving within the public sphere. Overall, 20 architecture firms submitted and 10 semi-finalists were chosen. The three finalists for the competition were each awarded $10,000 to finalize their concept and VOA Associates was selected as the winner. The Pullman Artspace strives to preserve Pullman as a leading arts neighborhood with an immersive creative hub for its residents. 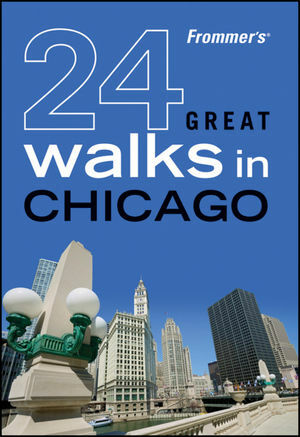 Photo courtesy Chicago Architecture Foundation. 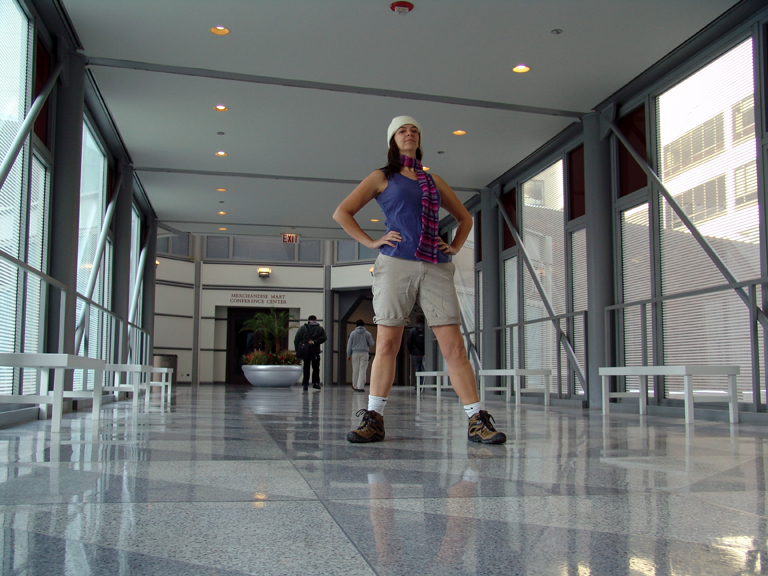 The Chicago Architecture Foundation is inviting fans of Chicago Loop buildings to participate in an architectural scavenger hunt on Saturday, June 7. 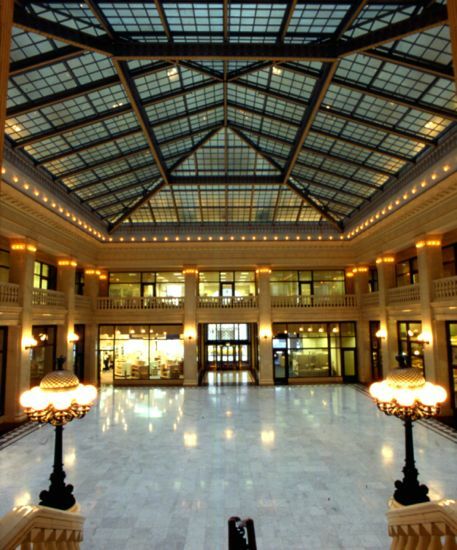 The three-hour game will be followed by an awards reception in the atrium at the CAF's headquarters, the Railway Exchange Building (formerly the Santa Fe Buildng), 224 S. Michigan Ave. The clues might involve an intro about the historic nature of a building along with a clue to images or ornaments on its façade or in its lobby. Participants will be asked to write down the answers to the clues and to take a photo and post it to a social media site. Registered participants will receive a t-shirt, a Divvy bike pass, and a ticket for a drink provided by Goose Island Brewing at the reception. The scavenger hunt is part of a new CAF series that offers visitors a behind-the-scenes look at iconic buildings. 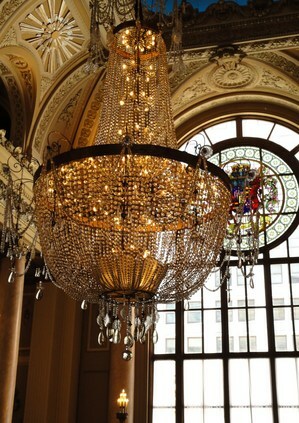 The first such event was an all-access tour of the Auditorium Theatre building in March. The CAF conducted a similar tour in May at the historic private Columbia Yacht Club on Lake Michigan, which featured a tour of the MV Abegweit "Abby" ferry, a 372-foot railway, vehicle and passenger ferry that is now the yacht club's dining and event space. The Chicago Architecture Foundation is celebrating its 125th anniversary by providing rare access to all parts of the landmark Auditorium Theatre. The first event in the CAF's new "Behind-the-Scenes" program will give guests exclusive access to the theater, including views from the 6th floor balcony, tours of the costume shop and dressing rooms and a walk onto the actual stage. The National Historic Landmark building, designed by the famous architectural team of Dankmar Adler and Louis Sullivan, was built in 1889. It was the tallest building in the country at the time and was sometimes called the "eighth wonder of the world." The theater is known for its perfect acoustics, stunning ornament and design, and its innovative architecture. Hosting the event and describing the history of the building will be Dawn Schuette, architectural expert and treasurer of the Chicago chapter of the American Institute of Architects. She formerly taught in the College of Architecture at the Illinois Institute of Technology. Schuette will describe the characteristics of the building that make up the innovative structure and sound quality. Chicago Behind-the-Scenes: Auditorium Theatre will be held from 6pm to 8pm on Tuesday, March 25, at the theater, 50 E. Congress Pkwy. Cost is $30 to CAF members and $35 for nonmembers, including one drink ticket. Reservations can be made here. For more information, see the CAF website or Facebook page. 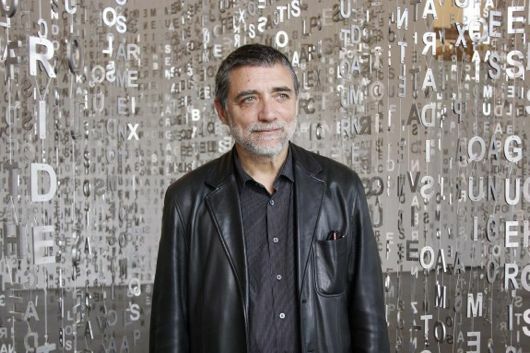 Jaume Plensa is a sculptor, a poet and a true creative spirit. He displayed all those talents and more in his appearance Wednesday evening at the theater at the Museum of Contemporary Art. The event -- titled "Architecture Is Art...Is Architecture Art?" 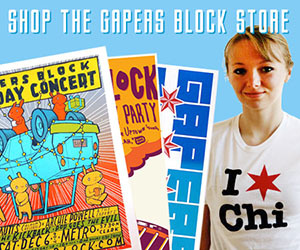 -- was cosponsored by the MCA and the Chicago Architecture Foundation. Plensa (his first name is pronounced "Jowma") is the creator of the magical Crown Fountain in Millennium Park. If you have ever taken children there, you'll know why I call it magical. The video faces and their waterspout mouths are funny and surprising, and the shallow depth of the pool and the showers that rain down the video columns at regular intervals bring about exuberance and playfulness in kids of all ages. Unity Temple, the Prairie-style concrete structure on Lake Street in Oak Park, is now open for tours, operated by the Frank Lloyd Wright Preservation Trust in partnership with the Unity Temple Restoration Foundation and the Unity Temple Unitarian-Universalist Congregation. Photo courtesy Frank Lloyd Wright Preservation Trust. The trust begins tours of the church Wednesday, October 2. The 45-minute tour can be combined with a tour of the Frank Lloyd Wright Home and Studio at 951 Chicago Avenue, about a half-mile from Unity Temple. Unity Temple is a National Historic Landmark, completed in 1908. It's the only surviving public building from Wright's Prairie period. The construction is exposed, poured-in-place reinforced concrete. Wright designed the sanctuary and the social room as two separate spaces, lit by skylights and joined by a low, central entry foyer. The original Oak Park Unitarian Church was destroyed by fire in 1905. Wright had to work with a limited budget and on a restricted site, so he made use of unusual materials--generally used only for factories and warehouses--to produce what is considered one of his most sophisticated accomplishments. You can tour Unity Temple at 875 Lake Street, Oak Park, Monday, Wednesday, Thursday and Friday from 9am to 3pm and Saturday from 9am to noon. Tickets are $15 and can be purchased online or at entry or by calling 312-994-4000. Street parking is available or take the CTA Green Line to Harlem and walk three blocks east on Lake Street to Unity Temple. .
"Starchitect" Jeanne Gang's Studio Gang Architects has been chosen to design a major new facility on the north end of the University of Chicago campus in Hyde Park. The complex will be a residence hall and dining commons planned around the university's house system, which emphasizes building community. The residence hall will house about 800 undergraduates in eight houses, with first year through fourth year students living together. Faculty members and advanced graduate students will live with the undergrads as resident staff. Each house will be structured around a three-story lounge for meetings, study and relaxation. The dining commons will also be organized by house so members of each community can eat with friends. 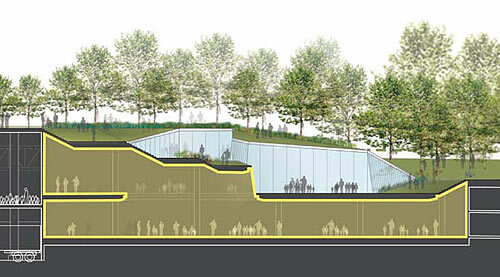 View of the commons; rendering by Studio Gang, courtesy University of Chicago. The complex will be built at the corner of 55th Street and University Avenue, where Pierce Tower now stands. Studio Gang will collaborate with Mortenson Construction; the project is expected to be completed in time for the 2016 academic year. The team will pursue LEED Gold certification, which recognizes design efficiency and sustainability. 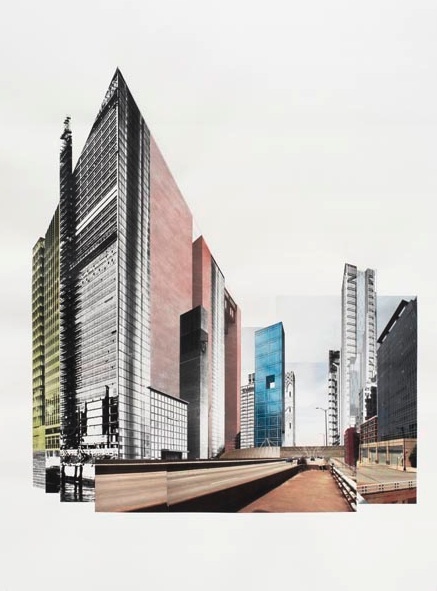 Architect Marshall Brown and artist Geof Oppenheimer will discuss architecture and urban imagery this Thursday at the Western Exhibitions gallery. Brown's exhibit Center of the World, Chicago shows that this urban designer thinks critically about Chicago's architectural history and the city's future, especially when it comes to downtown's Circle Interchange. If you have ever been driving downtown and reached the Circle, you may feel that encountering with this concrete mystery can be both daunting and time consuming. You may not know that in 1909 one of Chicago's famous architects, Daniel Burnham, wanted to build a civic center where the Circle exists today. Limbic, Impression from Tyler Yager on Vimeo. It's not that traditional architectural practices lack a focus on design and the execution of ideas. But after spending time in Tele Vision, the School of the Art Institute's final graduate exhibition featuring works from students in the Architecture, Interior Architecture, Designed Objects, and Fashion departments, it is apparent that like other departments in the school, SAIC students value the complete synthesis of the tangible and conceptual. 126 years ago this month, workers and reform activists in Chicago were reeling from the aftermath of what remains the most influential and memorialized event in American labor history. On the evening of May 4, 1886, a spontaneous protest took shape at Haymarket Square (Randolph and Desplaines, Fulton River District) as labor leaders learned of police and corporate aggression against striking workers at the McCormick Harvesting Machine Company on the previous day. The strikers had every intention of remaining peaceful; few that night had any idea they were marching into history. The legacy of May 4, 1886, still resonates with labor activists and allies today. 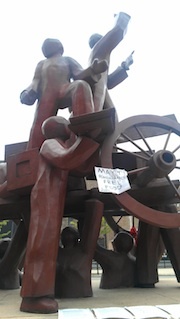 Here, handwritten notes and transcripts of condemned strikers' speeches adorn a statue commemorating the Haymarket Affair near the corner of N. Desplaines and W. Couch Place. 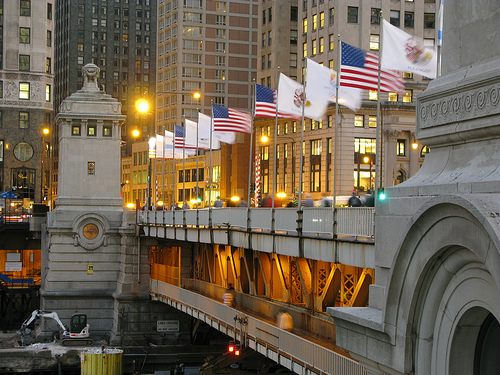 Back then, Chicago was acknowledged as the center of the American labor movement. The major issue of the time was the eight-hour workday, which national labor groups had adopted as a cause célèbre two years prior. Horrors! Anarchy might surely reign! The Architecture & Design Film Festival (ADFF) returns to Chicago this April for its third year and will be bringing with it an entirely new line up of 31 films from 13 countries. The festival is the largest in the nation that celebrates architecture and design. The five-day event, held at the Music Box Theatre, will comprise feature-length films, documentaries and shorts, as well as panel discussions with filmmakers, architects, designers and industry leaders. This year's repertoire profiles the drama, glory and creative spirit behind world-renowned constructions and architects. ADFF will begin the festival with the award-winning Unfinished Spaces, which chronicles the overdue revitalization of Cuba's National Art Schools project. Designed by three radical young artists commissioned by Fidel Castro and Che Guevara in 1961, at the onset of the Revolution, the schools gained momentum quickly, but construction was abruptly halted in the wake of the political climate and the architects were deemed irrelevant. After 40 years, the schools are in use, but remain unfinished. Now, Castro invites the architects to return and fulfill their long forgotten dream. A boat heads east on the Chicago River through the State Street bridge in 1910. Independent Chicago publisher City Files Press just relased a new photography book documenting the reversal of the Chicago River. The Lost Panoramas: When Chicago Changed its River and the Land Beyond draws from nearly 22,000 photographs made between 1894 and 1928 for the Sanitary District of Chicago. The result is a gorgeous volume chronicling the development of the engineering marvel, its context and its effects. As Booklist reviewed, "Williams and Cahan profile the players, elucidate the technological innovations, track the politics, and document the beneficial and catastrophic consequences of this massive and hubristic tinkering with nature." Check below the fold for a video providing an overview of the book as well as some additional sample photographs. The book is available for purchase directly from City Files Press. 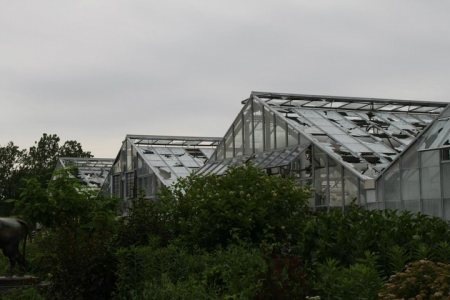 In case you haven't heard, the illustrious Garfield Park Conservatory was severely damaged by the hailstorm last Thursday, and The Hideout is hosting a special Soup and Bread benefit program tonight to help fund the cleanup and repairs. If you've been to the conservatory, you love it. If you've been to The Hideout, you probably love it, too. Why not stop by tonight (5:30 - 8pm) and stuff your face for a good cause? Details here. Last night, former Cabrini-Green residents gathered at the last remaining high-rise building, 1230 N. Burling, to celebrate the community's life while wishing it farewell. A few short speeches were made to the press, but the highlights were mixing with friends, performances by ThaBrigade Stamps Marching Band and the installation in the building itself. The band performed several numbers for the crowd as the sun set. The building is illuminated by the more than 100 LEDs of Project Cabrini Green. Demolition is scheduled to begin in the morning. David Schalliol has been documenting the Chicago Housing Authority's Plan for Transformation since 2003. 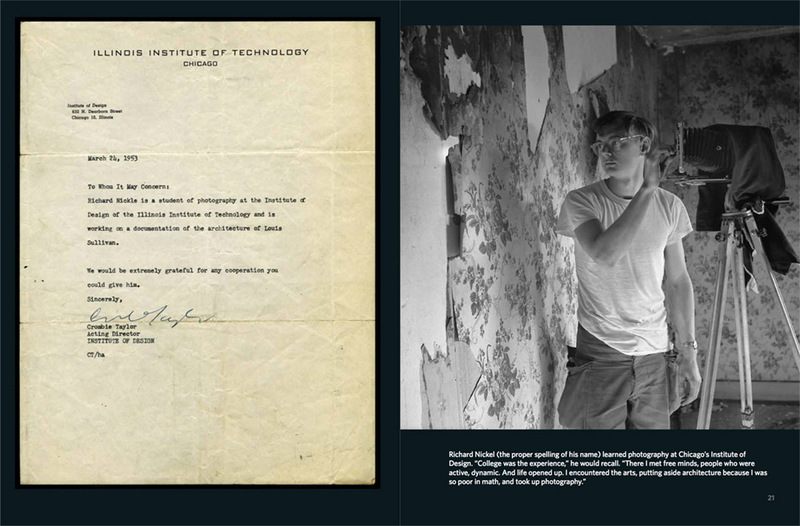 Additional images from his documentation may be seen on his website. Most Chicagoans who work in the Loop have some familiarity with the Pedway, Chicago's network of (mostly) underground passages and tunnels that transports pedestrians from the E,l to shopping, to work, without having to step foot out into the snow or rain. Many of us, however, use it purely to get to work and back, without ever bothering to find out just where the mysterious bends can actually take us. 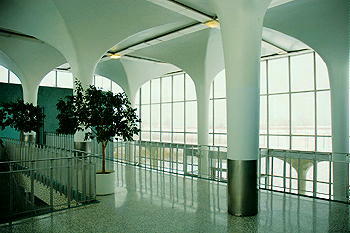 Let's face it--the Pedway can be downright intimidating. So, both locals and tourists will be interested in local improviser and tour guide, Margaret Hicks', reprisal of her Pedway Tour. The intriguing, 90-minute tour begins again this month, and features some of Chicago's most famous buildings, without stepping outside. "The Pedway is such a weird and wonderful place," says Hicks. "It's like a whole other world down there. Parts of it are scary, parts of it are beautiful but all [of] it is pretty warm - and that's a big plus," says Hicks. Approaching the marquee at 175 North State Street at noon, 2500 light bulbs await dusk to emblazon the façade of The Chicago Theatre. A group of tourists pauses for pictures. 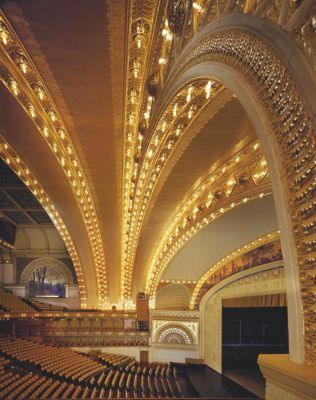 The iconic structure, once home to silent films and impressive organ concerts, persists as one of Chicago's most-recognized landmarks, continuing to draw crowds, even during hours when the stage is quiet. A few steps into the main lobby quickly begins to confirm for visitors why this iconic building was dubbed "the Wonder Theatre of the World" upon its opening on Oct. 26, 1921. The lavish marble interior, intricate moldings, and grand chandelier provide the air of a luxurious and bygone era. The windows above the doorway boast the coat of arms of theatre builders Balaban and Katz in Tiffany stained glass. Visitors of the 1920s would have been greeted by professional ushers, trained at the Balaban and Katz School for Ushers, as well as local beauties, costumed in white coifs and elaborate gowns matching the French Baroque interior. Standing at the bottom of the grand staircase today, these details are not difficult to imagine. The Architect's Newspaper is reporting that Joseph Rosa, the John H. Bryan Curatorial Chair of Architecture and Design at the Art Institute, will leave the institution to direct the University of Michigan Museum of Art. As anyone who's been to the Art Institute in the last few years knows, the role of design and architecture at the institution has significantly expanded under his tenure. Here's to looking forward to finding out what's next! New York based SHoP architecture firm was founded in 1997 by Coren Sharples, her husband, her husband's twin brother and another married couple. With a business doubling as a family, "you can't be a jerk to the people you work with because you have to go home to them," Sharples said last night at the Museum of Contemporary Art (MCA) for a lecture that was part of their Studio is the Subject series. Sharples began the talk with a description of SHoP's business practices that focus on ethics (they have never had an unpaid intern) and innovative design (the "kit of parts" idea). The kit of parts refers to models they remembered putting together as kids that came with the "sheet" of parts you could pop out and fit together. Referring to this concept, when SHoP sends out the pieces for a project, materialized and cut by computer, to a construction site, the laborers rarely have to measure or even cut. A little over a year ago, SHoP added SHoP Construction to further the in-house simplicity. Sharples, accompanied by a slide show, also chronicled quite a few projects. This was the most fascinating portion of the lecture. Sharples explained the firm's preference for sometimes working with smaller projects because of their ability to experiment. "The big rich people say they want something different, something no one's ever done before, but really there is too much money involved. They don't want to be guinea pigs," she said. She walked the audience through the process of the Museum of Modern Art's summer installation that had a budget of $50,000 and 4 weeks to be completed. 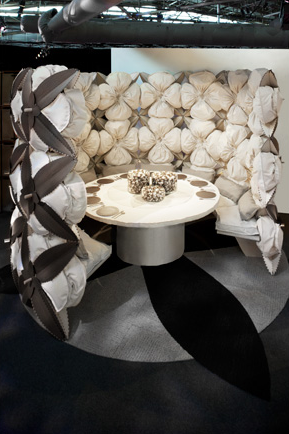 Another highlight was SHoP's installation for DIFFA and Supima Cotton, which involved enormous cotton bolls conceptualized into a wall used for one event that could be packed flat and reused again and again. There are seven more events for The Studio is the Subject series through May 22 and a full list can be found on the MCA's website. Recently, trends like the Renegade Craft Fair and the Slow Food Movement have shown people are recoiling from today's mass produced, dehumanized, and automated way of doing things. On the heels of this trend is the Apostles of Beauty exhibit at the Art Institute of Chicago. Much like today, the Arts and Crafts movement stemmed from an anti-industrialist mentality that placed an importance on thoughtful design and handmade artifacts. The exhibit is vast and varied and what is truly fascinating is every piece of art came from private collections in the Chicago area. Although most people were huddled around the pictorialist photography portion of the exhibit, the most "wow" inducing segment was the Japanism display. By the 1893 World's Columbian Exposition, Japanese style and woodblock prints were wildly popular (Frank Lloyd Wright was an avid collector). A Japanist-style Tiffany Lamp brilliantly glowing against the wall is hard to miss. Its dragonfly shade and mosaic base detail is breathtaking. This is a nicely curated show, especially for those interested in interior design, architecture, and Chicago history. It closes January 31st. If you've never been to I Space Gallery in River North before, go see "Architecture of Crisis" before it closes this Saturday along with the gallery itself. 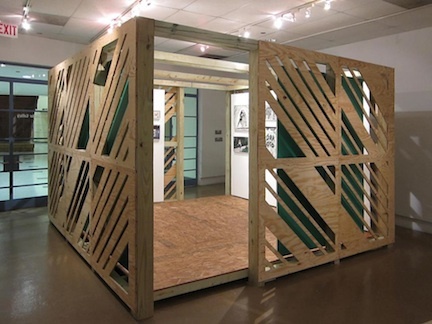 "Architecture of Crisis," co-curated by Beat Steuri, Julie Larsen and Roger Hubeli with the help of U of I architecture students, rethinks how to use existing housing materials to benefit the environment. This reexamination is important considering there is a potential surplus of 22 million vacant homes due the housing bubble and economic crash in the coming months. In yesterday's Sun-Times, Hubeli said "In America, standard construction is harmful to the environment on so many levels. Not only do we use cheap materials that are not sustainable, but we also have created an illusion of value." The show is a bittersweet elucidation on the current state of real estate that coincides with the closing of the University of Illinois' I Space Gallery in River North. In October, I spoke with Mary Antonakos, the gallery's director since its opening 18 years ago. With all the budget cuts, she explained, they just couldn't afford to run the gallery anymore and they were out of solutions. The show and gallery's last day is Saturday, December 19th. It is free. State Board Recommends Protecting Reese Buildings, Daley Says "No"
On Friday the Illinois Historic Sites Advisory Council unanimously voted to recommend adding the remainder of the Gropius-related Michael Reese Hospital buildings to the National Register of Historic Places. Later the same day, Mayor Delay rebuked the committee and stated he will press on with demolition of the campus. As it stands, one early building will be protected and one Gropius affiliated building is temporarily safe. Update: The National Park Service may expedite the review process for the complex. 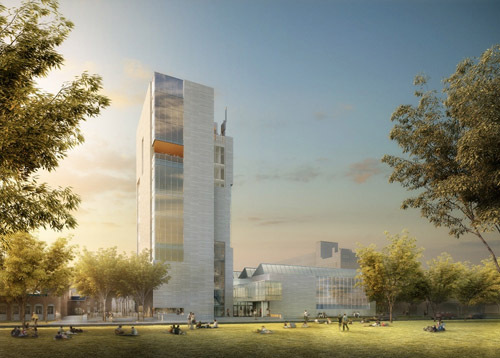 The U of C has publicly announced Tod Williams and Billie Tsien's design for the 170,000 square-foot Logan Center for the Creative and Performing Arts. 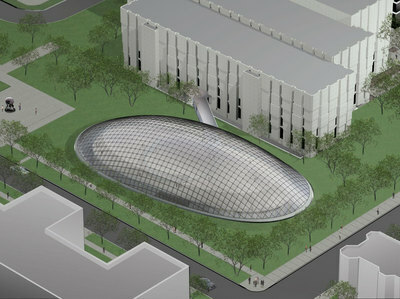 The building will be the new home for most of the U of C's arts activities when it opens in 2012. The Chicago Metropolitan Agency for Planning just announced a new photography contest for images of Northeastern Illinois. They're requesting images in the following categories: diversity, community vitality, natural environment, architectural/urban design and transportation, so if you want to contribute your shots, you have a chance to win photography classes, books, vegetables and walking tours, among other prizes. If you've ever considered taking a continuing education course in the arts (or simply miss the hitting-the-books, cramming-for-tests collegiate rush) take note: Loyola University of Chicago has just announced their Continuum Fall courses. The non-credit series of courses, lectures and workshops offer students of any age or interest more than 70 different options, many of which for a less than $300 tuition. While also offering courses in professional development, sustainability studies and communications, here are some humanities courses--from art and architecture to history and literature--worth checking out, with their schedules and cost. John Crouch took this photo of the Zaha Hadid pavillion in Millennium Park, designed as part of the 100th anniversary celebration of the Burnham Plan. The Tribune's preview of the exhibit from a few weeks ago offers some insight into how it was constructed. Churches, temples and synagogues represent some of the most beautiful buildings in Chicago, yet typically remain unvisited except by members of that particular denomination. Sacred Spaces International is hosting a summer tour series with the hopes of exposing these Chicago gems while simultaneously sparking useful discussion among members of different faiths. Suzanne Morgan, founder of Sacred Spaces International, possessed experience as a liturgical architect and, according to their website, started the organization in 2002 as a response to a cooling of interfaith understanding after 9/11. In intention if for people to explore these spaces and learn about the uniqueness and nuance of a particular religion set in the universal language of architecture. The tours take place every Thursday and run through October. This Thursday's tour is of the Fourth Presbyterian Church on North Michigan Avenue. The fee for members is $5, non-members $15. Register online. After months of delays, Zaha Hadid's proposed Burnham Plan Centennial Pavilion is due to officially open on Tuesday. If you can't wait to see it until then, the Trib has a sneak peek. In a metropolis of neighborhoods it's easy to feel trapped in your comfort zone--which may seem like an oxy-moron until visiting friends in Wicker Park equates to traveling abroad. And the city's way too big to truly appreciate commuting back and forth from Wrigleyville to the Loop. That's why the Chicago Office of Tourism's Neighborhood Tours feels like you're discovering an entirely new, self-sustained city a mile or two from your apartment. OK, I know what you're thinking, "But I'm local, those tours are for those tourists who take pictures of themselves in front of Harpo Studios or wait an hour to get into Giordano's." The Neighborhood Tour guides know exactly how you feel--they don't even tour the Loop; or Wrigleyville for that matter. So why not venture a tour of Kenwood and Hyde Park or further South to Pullman's Historical District--two of the most popular tours among Chicagoans. Here are just some of the tours, suggested by the Office of Tourism, for locals. Looking to buy some property? $300,000 might fetch you a nice two-bedroom condo in Lincoln Square, or you could invest in something more spacious: how about a 14-floor, 3 million square foot fixer-upper in the West Loop? Something that, say, straddles the Eisenhower as it becomes Congress Parkway? On August 27, 2009, the United States Postal Service is liquidating the former Chicago Main Post Office at auction with the suggested starting bid of just $300,000. The building has been vacant since 1997, when the need for modernized sorting equipment forced a move from the old location at 404 W. Harrison to its current site at 443 W. Harrison. But vacant buildings still require heat, and the owners still have to pay property tax. So this hulking structure -- which occupies four city blocks -- has been a major thorn in the Postal Service's side for 11 years. In fact the Postal Service has tried to sell the facility by "traditional methods" before, resulting in a few failed bids. Enter Rick Levin and Associates, the auctioneers hell-bent on bringing the gavel down once and for all on this massive structure. The real estate auction firm announced in June it would offer the building, "to be sold absolute, regardless of price." Postal Service higher-ups believe the transparency of an open auction -- not to mention the eyebrow-raisingly cheap starting bid -- will result in its sale. Finally. Speaking of Studio Gang, the firm earned new accolades for a Chicago residence known as the Brick-Weave House. The residence makes use of 30% of the existing structure, including a carriage house, and incorporates a garden into the front section of the building. Doing all of that on a relatively tight budget earned its inclusion on Architectural Record's Record Houses 2009 list. Attention armchair architects: the Frank Lloyd Wright Preservation Trust kicks off volunteer training for the Oak Park Home and Studio and Robie House this June. The program prepares you to be a tour guide (they call it "interpreter") or museum shop volunteer: the Trust imparts you with in-depth knowledge about Wright, architecture, the surrounding neighborhoods (the Robie House is located in Hyde Park), and how to tell all that to visitors without sounding like a docent drone. The training sessions for the Oak Park Home and Studio are conducted on Tuesday and Thursday nights and Saturday all day for two weeks beginning June 2nd. Training for the Robie House takes place on the same schedule starting June 16th. If you're interested and want more information, email volunteer@gowright.org or call Megan Anderson at (708) 848-1976 x249. Speaking of finishing projects, the Art Institute's Modern Wing is nearly finished in preparation of its grand opening on this Saturday, May 16. If you've been aching to see inside, here's a sneak peek. While it will be free during its first week open, that price hike is still going through, although the increase may be a little smaller for Chicago residents. Now that the spire on top of the new Trump International Hotel & Tower is complete, Kamin has fired up his criticism of the addition as "a towering toothpick ... a plastic toy ... a Kmart accessory for an Hermes suit." He's obviously displeased, and throws complaints at Daley, Trump, Adrian Smith and Skidmore, Owings & Merrill along the way. A commenter after the end of the piece wistfully remembers these two former designs. The Chicago Architecture Foundation is making sure no one is able to use "there's nothing to do" as a reason for staying in. The CAF has just announced their spring and early summer events, tours and programs. Events headlining this year are, appropriately enough, centered around the Burnham Plan Centennial. The Chicago Model City exhibition will display a highly detailed model of Chicago at the foundation's gallery. Coupled with the model of the city Burnham designed are exhibits that focus on the character behind the plan. With the popularity of The Devil in the White City, readers have become more familiarly with this seemingly mythical character. B Like Burnham will feed this curiosity and attempt to answer the question "Who is Daniel H. Burnham?" Both exhibits open on June 11. In addition to an abundance of walking tours, lectures and daily river cruises (starting tomorrow), the CAF is offering evening boat cruises every Thursday, starting in June. 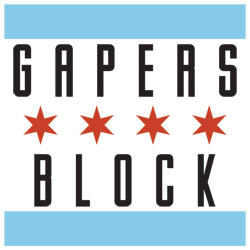 To see the full roster of the Chicago Architecture Foundation tours, click here. Things are looking a little brighter on the Congress side of the Harold Washington Library. According to Ruth Lednicer, director of marketing for the Chicago Public Library, the aluminum ornaments (they're seed pods and barn owls -- did you know that?) that cap the building are getting resurfaced -- scraped, cleaned and repainted -- and the project should be done by mid-June. The American Institute of Architects named the Jewish Reconstructionist Congregation synagogue to its list of the top 10 green buildings at its 2009 National Convention and Design Exposition in San Francisco. Last year the synagogue got the highest green building rating -- a platinum Leadership in Energy and Environmental (LEED) from the U.S. Green Building Council in Washington, D.C. -- and was the first house of worship to receive the designation. The AIA says in its recognition of the building, "JRC's commitment to the principle of tikkun olam--Hebrew for 'repairing the world'--is manifest in the building's architecture." The building was design by Chicago-based Ross Barney Architects. Photo by Flickr user mmmmarshall. The Burnham Centennial Celebration Committee presented today the first images of the two pavilions that will grace Millennium Park this summer. Designed by "starchitects" Zaha Hadid and Ben van Berkl, the post-modern structures should be huge attractions for those who visit Chicago after June 19th. The Chicago Tribune reported on the unveiling this afternoon at the Chicago Cultural Center. The sidewalks on the west side of the bridge have been replaced with a slip-resistant fiberglass material, and new lighting and flagpoles have been installed. But most noticeably, the once drab, green-grey guardrail has been replaced by a replica of the original 1920 rail, detailed in the 1909 Burnham Plan of Chicago, and has been painted "Bordeaux." Top photo: Flickr user rpongsaj; Bottom photo: City of Chicago press release. Do You Know of Any Green Stone Façades? Inspired by Pullman's distinctive serpentine limestone Greenstone Church, GB flickr pool member chicago boulevardier is seeking other Chicago green stone buildings to photograph, like this one. 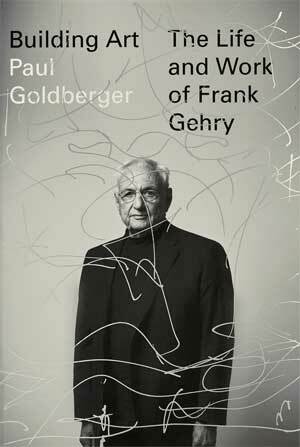 The Museum of Contemporary Art is hosting a celebrating of a truly visionary architect/philosopher/inventor/forecaster/poet/alternative energy advocate. If you couldn't guess by all the slashes, the DYnamic MAXimum celebratION is an homage to the life and work of Buckminster Fuller. Three floors of the MCA will be packed with entertainment and programs focused on the often enigmatic genius known, most famously, for his geodesic domes. The celebration marks the opening of the new exhibit Buckminster Fuller: Starting with the Universe. As the title suggests, it is centered around "Bucky's" large-scale ideas such as the creative forces in nature that allows it "build upon itself"; a topic Fuller mined for lessons on how to create a more sustainable society. It is these ideas that find themselves incredibly pertinent in today's culture, despite being pioneered by Fuller more than 50 years ago. In addition to displays of never-before-seen models and sketches, MCA's website states that it will be highlighting Fuller's connections to Chicago. This should be particularly interesting, considering he almost committed suicide while living here. The celebration is tomorrow, Friday March 13th and runs from 6 p.m. to 9 p.m. The cost is $35 for members and $40 for non-members. The exhibit, Buckminster Fuller: Starting with the Universe, will be at MCA until June 21. 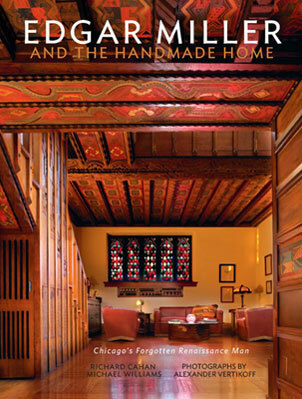 Chicago design and architecture blog PrairieMod recently reported that an historic Frank Lloyd Wright home in Glencoe is under threat from the wrecking ball. Well, sort of. 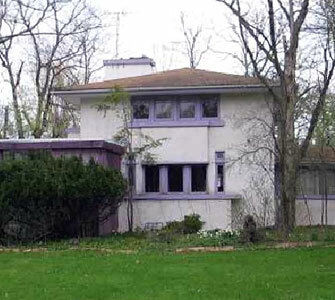 According to the Landmarks Preservation Council of Illinois, the William F. Ross House (1027 Meadow Rd.) has been vacant for two years and is currently on the market "as is" after the heating pipes burst last winter. This means a potential buyer could purchase the property with the intent of tearing down the home. If that happens, it would be the first time an intact Wright home has been demolished in the U.S. in over 30 years. If you don't have the $575,000 to buy the property yourself, you can help by urging Glencoe officials to work with potential buyers on renovating the property, rather than rebuilding on it. More information is available on the Landmarks Preservation Council website. Burnham at 100: Forever Open, Clear and Free? 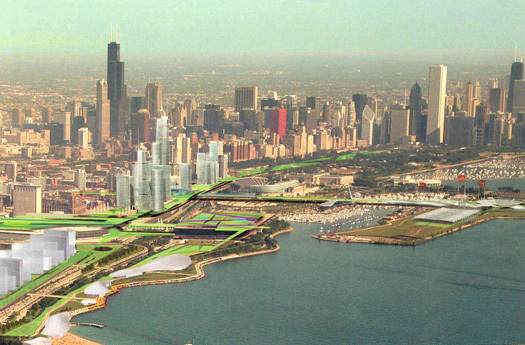 The epic battle for Chicago's lakefront continues. In celebration of the 100th anniversary of the Burnham Plan of Chicago, the Chicago chapter of the American Institute of Architects announced a contest to create a Burnham memorial that would, "inspire and educate the public, and honor the memory and importance of Daniel Burnham and his Plan of Chicago." The competition, backed by the Field Museum and the Richard H. Driehaus charitable trust and endorsed by the Chicago Parks District, is under fire from some who criticize the proposed site of the memorial: on the lakefront lawn of the Field Museum. Ever since Burnham uttered the famous words, that Chicago's lakefront "by right, belongs to the people," citizens have been up in arms about what belongs in the parks along the shore and what doesn't, from Lake Shore Drive, to the proposed site of the Chicago Children's Museum, to the spaceship that crashed into a Bears game. Granted, the proposed competition doesn't guarantee that the winning design will actually be built, but as the Chicago Tribune reports, there are some big financial backers invested in the project. Some Burnham fans, however, are less interested in building a memorial and more interested in continuing Burnham's legacy as an urban planner, "to ensure that metropolitan Chicago continues to be one of the world's best places to live and work." The Burnham Plan Centennial is hosting a series of events this month that explore Burnham's original plan and how his ideas will shape the future of Chicago's urban landscape, lakefront and beyond. What happens when you mix Columbia students and a building full of floor-to-ceiling windows? Taking a cue from the Smurfit-Stone building and other Chicago skyscrapers that express themselves in panes, Columbia College television major Joe Jacks recently convinced 80 residents at the 2 E. 8th Street residence hall to insert construction paper circles (450 in all) inside their windows, with one giant Pac Man taking up two panes. The result, visible from the street, looks like a giant arcade game. Building community director Sharon Ptak told the Columbia Chronicle, "As long as it is not offensive, they can pretty much express themselves however they want." Stick that one in the next residence life brochure! Flickr photo from the 2East8th Pacman set by Brit Reed. The complete Chicago 2016 Bid Book is now online here. Check back later today for a full run down of all the new architecture projects proposed. Since the Lakeside Veterans Hospital was reduced to a de-constructed pile of rubble last summer, pedestrians now get a better view of architect Bertrand Goldberg's clover-shaped Prentice Women's Hospital. Goldberg designed several notable Chicago-area buildings, including Wright College, the Astor Tower, and, most famously, Marina City. 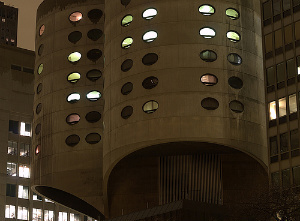 And while it has been proposed that Marina City receive landmark status (it is not on the current list of Chicago landmarks), Prentice Women's Hospital remains in relative obscurity (well, it hasn't yet graced the cover of a Wilco album). There are those in the architecture community who fear Goldberg's hospital might suffer the same fate as its counterpart down the street, seeing as actual hospital operations moved from the Goldberg building at 333 E. Superior to a new location at 251 E. Huron in 2007. If that thought terrifies you, the Commission on Chicago Landmarks meetings are open to the public and the next one is March 5. Landmarks Illinois also has a list of regional advisers, sort of like architectural Congressmen, who act as the organizations "eyes and ears" on all things building preservation. Find yours here. 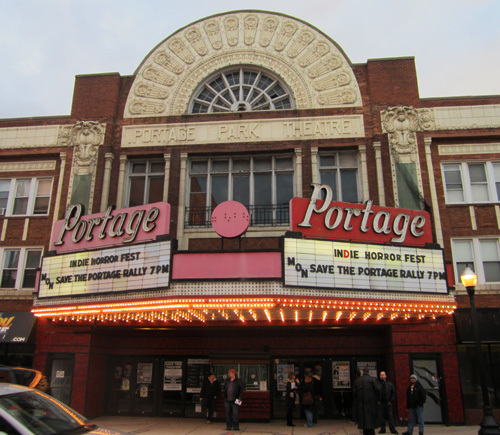 Preservation Chicago has just released its annual list of the city's seven most endangered historic places. Your may be surprised to learn that your own home is at risk, or at least part of it -- new aluminum and vinyl windows are quickly rendering the old-fashioned wood window a relic of the past. For more information on why that's a bad thing and to find out which other Chicago landmarks are in danger, visit the Chicago 7 site. While the earthly real estate environment has gotten decidedly more difficult for architects in the past two years, a couple of architects have found a new market. Archi-artists Arturo Vittori (Italy) and Andres Volger (Switzerland) are opening a new exhibit at the Italian Cultural Institute of Chicago, aptly titled "From Pyramids to Spacecraft". Beginning March 11th, the show will feature their hyper-real graphics and models of such futuristic projects as MoonBaseTwo, an inflatable space station or MercuryHouseTwo, a self-contained, mass-produced space eco-home. If the use of the hyphen in the previous sentence seems a bit excessive, it is only because their studio, Architecture and Vision, works beyond the typical scope of an architectural project. Their designs combine much of the mechanical ingenuity of Leonardo da Vinci with modern-day technological challenges. Check out their work at Architecture and Vision's website, here. In case a $4,320 cake wasn't in your means but you're still interested in future of the Farnsworth House (last fall marked the third time in 16 months that Mies van der Rohe's modern architectural icon in Plano, Ill. has been threatened by flood waters), this Thursday the Farnsworth House's site manager lectures at the Chicago Cultural Center about the two recent floods, their cleanup and aftermath, and future plans for the landmark. The building was "rescued" five years ago when a group of preservationists bought it at auction for $7.5 million after "Baron" Peter Palumbo found its upkeep too financially risky. The site is now maintained by Landmarks Illinois, the organization sponsoring Thursday's lecture. If you can't make the lunch-time talk, Landmarks is currently seeking volunteer docents to make the trek to Plano once a month, April through November. More information about Thursday's lecture in Slowdown. Check out some incredible pictures taken by Trump Tower's crane operator, here. 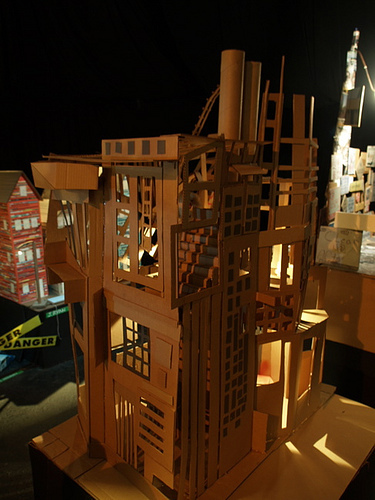 eob shared this snap from the Exquisite City exhibit at the Viaduct Theatre. I thought (hoped) this might be made of gingerbread, but alas, it's recycled cardboard. The Chicago Park District has announced a $35 million plan to redesign the controversial site in front of the proposed Chicago Children's Museum. Daley Bicentennial Plaza, seen universally as the "nowhere" at the other end of Frank Gehry's BP Bridge, was the subject of a Request For Qualifications (RFQ) for design services issued last week. 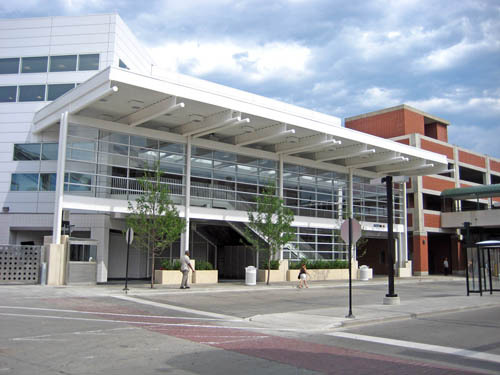 The new design work will be coupled with repairs to the moisture membrane over the Monroe Street garage. The park district's intention appears to be for the new design to assume the Children's Museum is in place. In all likelihood, the new design will be much more modern than its current Beaux-Arts composition. Continuing the precedent set by Millennium Park, new projects should continue to transform the lakefront from an outdated promenade to an egaging 21st century space. If you've got a closet Howard Roark on your gift list this holiday, the Frank Lloyd Wright Preservation Trust is offering a series of Architecture Fantasy Camps starting in March. The camps, which have been running since 2002, take place in the drafting room of the Frank Lloyd Wright Home and Studio in Oak Park. They run March 6-9, June 14-17, Aug. 2-5 and Oct. 4-7. The cost is $900 ($850 for Preservation Trust members). The four 2 1/2-hour sessions comprise a crash course in drafting the old-school way, without a computer, and include tours of the Home and Studio, Robie House and Unity Temple. The end product: campers create frameable floor plans of their dream homes, and believe it or not, they don't all come out looking like Taliesin. "Most do not design prairie-style homes on the exterior," said Preservation Trust Director of Education Jan Kieckheifer in an interview last year with the Daily Herald. "But most end up using a lot of Wright's ideas." The camps are open to fantasy architects of all skill levels, and the fee includes the cost of materials. Call (708) 848-1976 for more information, or click here. Crain's Chicago Business has a short slideshow of some of the coolest office interiors in Chicago. Corresponding with the O'Hare Modernization Program, the Chicago Architecture Foundation is planning a series of events relating to Chicago's gigantic, and often enigmatic airport. Opening with a new photographic exhibit of the ORD, the series of lectures and programs shines light on these astoundingly complex buildings. The photographs, by Robert Burley and Hedrich Blessing, highlight design at O'Hare from its first terminal opening to present day. Most programs in the series are free and open to the public, however, if you would prefer something more detailed, there are 30 spaces open for a behind-the-scenes look at the operations of ORD. Check the Slowdown calendar for all the events and check back here for more details as the programs come. If you're curious about the design of the proposed new Children's Museum in Grant Park, check out the Trib's graphical feature along with renderings from Krueck + Sexton Architects. The Chicago Architecture Club has announced the winners of their High-Speed Rail Station Competition, Chicago Tribune's Blair Kamin reports. While entirely theoretical (an unimpressive office building currently stands on the site) the design posses an interesting approach for a project surrounded by skyscrapers. Rather than filling the city block street front, the design appears folded or even pushed into the ground, meeting the river almost at grade. 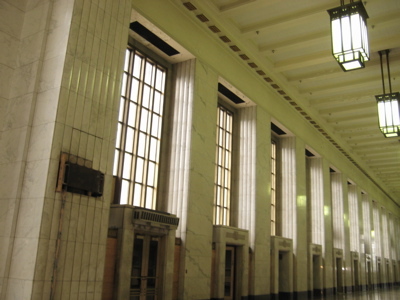 Restored to prominence would be the colonnade and grand hall of Union Station, which currently serves as little more than an appendage for large events and loitering. 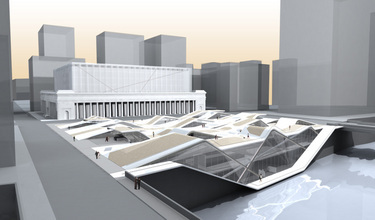 As any regular Metra rider can attest to, this design would be a sleek, tactile solution to the hardly humane condition of the current Union Station platforms. Check out the CAC's web page for the competition criteria. Okay, that was a sorry attempt at a Frank Lloyd Wright architecture joke. Like any professional organization, the American Institute of Architects can't help but get involved in the election issue business. To encourage more of its members to see an architect as an advocate for sustainable architecture, land use, and social policy, the AIA has initiated its DesignVote08 program. The "Government Advocacy" section of the AIA website links to a varied of different statements and positions including the AIA's 2008 Federal Advocacy Agenda where the headlined issues read, "Designing a sustainable future, Promoting healthy and safe communities, and Helping architects practice their profession." Locally, questionnaires were sent out to Congressional candidates and their responses can be found here. Sadly, few Illinois candidates took the time to respond which seems to correspond to the dearth of responses nationwide. Perhaps as the AIA grows into their role of public advocacy regarding all aspects of the building profession, politicians will begin to see architects and designers as a valuable ally. With the green movement diversifying everyday, aesthetic definitions of what a green project looks like are changing everyday. The two projects below, while not as spectacularly designed as the bank-busting Chicago Spire, are extraordinary for the way in which they represent the growth of the green building movement. Both projects are seeking LEED Certification, yet the aesthetics employed by each architect differ greatly. The first project, the Ecologic Lofts in Bucktown chooses the sleek, modern aesthetic that has accompanied other green projects such as Helmut Jahn's SRO project. Wind turbines and a glossy facade help complete motif. Contrast this with the Eco18 project under construction in the South Loop. Ornamented cornices and a base designed for street level shops sets this building firmly in classical genre. 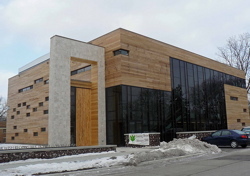 One green feature of note is that this building includes both geothermal to provide heated air and solar power for heating water. As the green movement matures, vernacular development should continue to expand approaches to design. 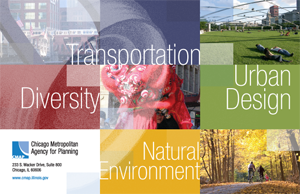 As part of GB's continuing coverage of the 100 year anniversary of Daniel Burnham's plan for Chicago, Metropolis 2020 has announced dates for several of the main events surrounding the year-long celebration. 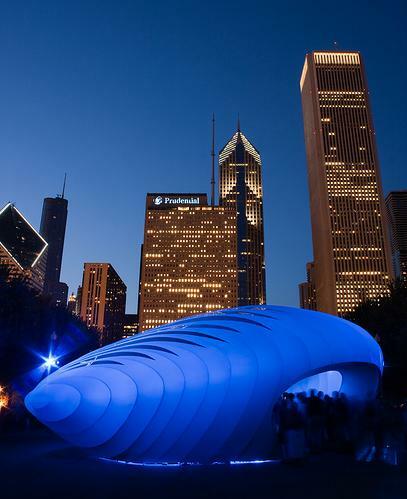 Most notably, it was announced that the two new pavilions, one by Zaha Hadid and the other by Ben Van Berkel, will be unveiled in Millennium Park on June 19th, 2009. Chicago architecture firm, UrbanLab, which first gained notoriety from the History Channel's "City of the Future" competition is featured in a short write-up on Architectural Record's web site. The appropriately named urban design firm's idea to turn Chicago's ubiquitous boulevards into a wastewater and stormwater remediation system is building support with the city's brass. UrbanLab has begun to draw more defined schemes for four neighborhoods, including Little Village. Among the pocket part and eco-boulevard designs, presentation media is being rolled out to help introduce this concept to the residents and, hopefully, be part of the South Side's rebirth with the Chicago 2016 Olympics. As UrbanLab principal Martin Felsen states, " The South Side does not have to become a replica of the North Side...It can transform to be a better urban model. We want to be part of that." 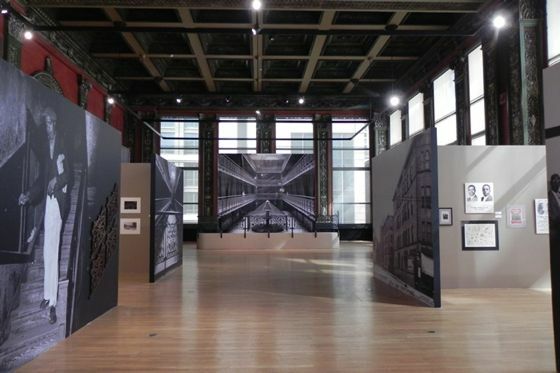 The Chicago Architecture Foundation has opened an exhibit this week highlighting the similarities between late 1800's Chicago and present day boom-towns in Asia and the Middle East. When Chicago grew by over 1.5 million people in 50 years architecture followed with years of stunning innovation and excitement. Similarly, cities like Abu Dhabi and Shenzhen are exploding their urban boundaries and money for building and infrastructure has, literally, shot for the sky. The exhibit seeks to analyze the growth's aesthetic implications to discover if there is an underlying architectural or urban form that all boom towns share; or, does the emergence of the Chinese megalopolis and gold-plated oil cities of the Middle East represent a new type of urbanism? Featured works range from the ubiquitous Alder & Sullivan buildings to the cutting edge zero-energy towers sprouting up in design studios worldwide. Lynn Becker is the curator, so you know it will be a well-constructed and thought provoking exhibit. The exhibit runs from September 23 to November 21. 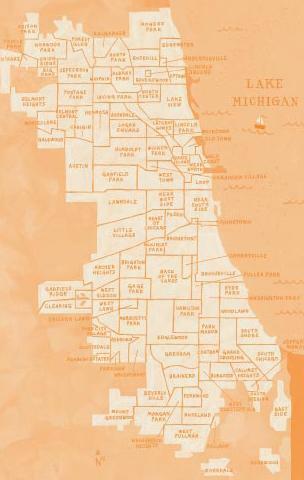 Over at Hyde Park Progress, David Hoyt has posted an interesting critique of the Tribune series Neighborhoods for Sale. The Tribune calls the feature an "unprecedented investigation" into the financially-driven friendships between aldermen and real estate developers over the last decade. And Hoyt doesn't disagree that there's been some improper wheeling and dealing between these two groups; rather, he notes that the Tribune misses half of the story by failing to discuss the dynamics of development on the south side of the city. It's a brief but worthwhile read for anyone who's wondered why so many buildings (like the beautiful St. Stephen's church in Hyde Park) remain abandoned. For anyone who is looking to get their fill of South Side architecture, the Meis van der Rohe Society is organizing a tour of area architecture highlights this Saturday. The free tours at each building listed below are intended to introduce the new residents of the neighborhood to some of the area's past, present and future. For a Google map of (most of) the destinations click here. As the most ambitious building project in half a century continues to plod forward, Kelleher Development has released new renderings of the 150 story Chicago Spire on their sales site. Currently, the caissons have been drilled and utility work progresses slowly while a general contractor is selected for the building's superstructure. Be sure to explore the Spire's site, not only does it contain some unbelievable panoramic photos of downtown but it also has a showy sales video narrated by Bill Kurtis (whose career has undergone somewhat of a renaissance of late). You'll also notice, as was pointed out by some commentators on Blair Kamin's Tribune blog, that the Trump Tower was left out of the renderings. Dueling developers anyone? Laurence Booth of local firm, Booth Hansen, is featured in an article in this month's Chicago Magazine highlighting his ongoing career of applying his design method to whatever project may enter his door. Among discussing his controversial project in Evanston or his high profile Joffrey Tower project downtown, the article asks the question, "why turn on your previously professed disliking of high-rise buildings?" Booth, soundly inline with sustainable environmental policy, expresses his concern at the way growth in this country has drained resources and increased consumption. He continues that the increased density that efficient uses resources spurred him into the high-rise market. The article continues to explore his evolving career in the context of the scale of his projects. Status quo in architecture, the article states, is that residential architects work in anonymity and everyone else fights for commissions. However, Laurence Booth's path to the elite group of Chicago architects features his residential work as predominately as his later, larger projects. The article also highlights a few of Booth's projects that have been unequivocal success, such as recently completed, 30 West Oak Street. 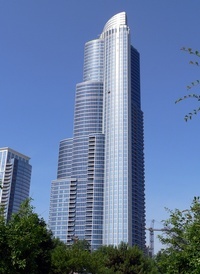 In case you missed it last weekend, Trump Tower was topped out. While the concrete is done being poured, the building will stretch skyward a bit more once the "spire" is installed. In the meantime, check out this cool panorama video from Fox News Chicago. 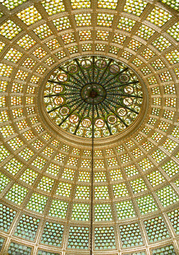 After a mistaken picture in an earlier post (oops) the media relations manager with the Chicago Department of Cultural Affairs was kind enough to correct me and send along some photos of the completed dome. Both domes are stunning, but only one is the real Tiffany! Click here for the corresponding press release. Looking for something to do tonight? Check out the lecture "The History of Architecture and Culture on 63rd Street" at the Hyde Park Arts Center, 5020 S. Cornell Ave., starting at 6pm. Presenting will be Lee Bay, architecture critic and city planner and artist Theaster Gates. The presentation will focus on history of art and architecture in Hyde Park and how art can mediate neighborhood rejuvenation and link the future with the past. If you miss it, don't worry: Chicago Public Radio will be recording the event in its entirety for permanent posting on their website as part of their "Chicago Amplified" series. This month's Architectural Digest features the recently restored Art Moderne home of photographer Michael Marientha. It's one of the magazine's features acquired through the new open auditions process. Queen's Landing, the spot where, in 1959, the British monarch stepped off her boat on her way to Buckingham Fountain has since been closed to pedestrian access from west of Lakeshore Drive, much to the despise of Chicago Tribune's Blair Kamin. The loss of access becomes especially evident every Wednesday and Saturday night when people sit on the steps of the fountain's plaza and the Navy Pier fireworks compete with racing headlights and honking traffic. However, as the article states, there is hope to reclaim this space in the name of good urban design. The plan quietly being passed around proposes another, soon to be ubiquitous, bridge in Grant Park spanning the Drive. 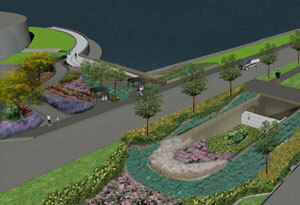 Supported by the Grant Park Conservancy the renderings show a vast improvement over the current conditions. Instead of the broken concrete slabs that detract from the lakefront experience a new plaza, on axis to the fountain, would allow panoramic views of the lake and the skyline. The second of two Congress Parkway-related projects is a general streetscape improvement from the post office to Buckingham Fountain. Introduced at a Grant Park Advisory Council meeting, the project would consist of upgrading all the sidewalks to the exposed aggregate type, as seen on Michigan Avenue, installing new street lighting and furniture, and installing planted medians to correspond with some minor lane realignments. However, the most interesting idea proposed was synchronized street lighting effects that would use LED's to "link" the whole parkway to its eastern terminus at the fountain. This would be especially welcome at stretches such as the one under the Chicago Stock Exchange that now are a vital link to new West Loop developments and the lakefront. Some more information can be found in this Chicago Journal article. There is no timeline yet on either of these two projects but, like all recent urban design proposals, expect a significant amount of attention in Chicago is chosen to host the 2016 Olympic Games. The NY Times profiles Adrian Smith, the architect who was active on major projects at Skidmore, Owings & Merrill before moving on to his firm Adrian Smith & Gordon Gill Architecture. The Chicago Architecture Foundation's exhibit "Green with Desire: Can We Live Sustainably in Our Homes?" 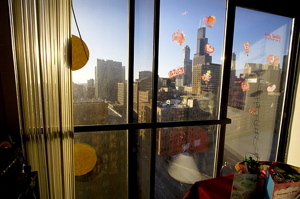 is entering into its last month of display at the CAF's building at 224 South Michigan Avenue. One of the most engaging aspects of the exhibit are the case studies of eight typical Chicago housing types and how they employed green housing strategies. In addition, the CAF has a list of several upcoming events centered on architecture and environmental sustainability. Exhibit runs through September 5. The Museum of Science and Industry is boasting the "greenest house in Chicago" with their Smart Home, Green + Wired exhibit. Resting the the museum's backyard, the sheik, modern structure examples various advances in prefabrication and buildings control systems. Ubiquitous green building measures such as solar panels and a vegetative roof are also highlighted. Exhibit runs through January. The Chicago Tribune architecture writer, Blair Kamin, features an article contrasting Beijing's Olympic architectural strategies to those proposed by the Chicago 2016 team. Beijing's Olympic architectural identity can probably best be understood under the influence of some significant hallucinogenics. Seriously though, as Kamin explains, China's federal funding free-for-all has allowed the Beijing 2008 committee to complete some of the most aggressive building projects conceived. For instance, the swimming pavilion is appropriately nicknamed the "Water Cube" as it is covered by advanced plastics stretch of a metal frame. The various structures portray such a surreal quality that it is difficult to convince your eyes that the images is not a poorly executed photoshop project and are, in fact, real places. One has to wonder if the effort to display these buildings as evidence of an emerging "Chinese" style of modern life will play as anything more than a series of fantastical exhibits in what is, regardless of the Olympics, a growing center of urban culture. Chicago's Olympic plans focus significantly on stitching patches into areas of a broken urban fabric. Rather than emphasizing marquee, sparkling buildings, the 2016 committee is taking its impetus from the Barcelona Olympic games well-documented rejuvenation. Infrastructure improvements, conversions to public housing and the expanding of access to the lakefront are all parallels to the highly successful Catalonian games. As Kamin correctly points out, these vital efforts are often completed without the pizzaz and architectural star-power of an abstract, net-like stadium. While Beijing's Olympic operation is actually quite separate from the healthy collection of marquee buildings the city already possesses, the Chicago proposal calls for highlighting the existing beauty of the lakefront skyline. While the skyline would serve as a beautiful backdrop, the IOC's technical review of Chicago 2016's plan states, quite clearly, that the excitement factor for the Chicago 2016's building and transportation program leaves quite a bit wanting. While the CTA struggles with an outdated train system, at least their stations don't look it. In addition to the Grand Red Line station and several Brown Line stations, the Howard Street Station's new modern self has almost been completed. The platform maintains the warm, massive industrial feel experienced at other newly renovated stations such as the Chicago, Brown line. The entryway, however, possesses clean lines with a cool glass and aluminium panelled facade. In addition, the new entryway hugs the sidewalk and creates the strong, well-scaled streetwall that is so valuable in creating a functioning city street. Regardless, the true achievement is turning a dingy, urine-stentched building into a modern transporation terminal that transit-nerds so greatly admire in Asia and Europe. 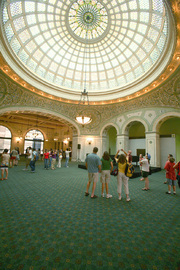 For pictures and detailed info, check out www.chicago-l.org's webpage on the station. FLW Road Trip... Better fuel up! Robie House in Hyde Park, Home & Studio in Oak Park, Taliesin in Spring Green and ... a Phillips 66 in Cloquet? 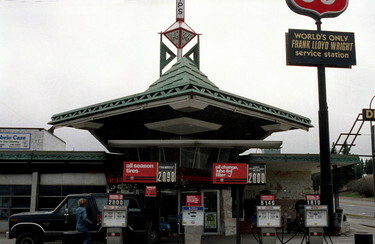 It may seem unbelievable but Frank Lloyd Wright actually designed a gas station in the small Minnesota town of Cloquet. According to the Chicago Tribune, it is celebrating 50 years of Wrightian glory with a Symposium host by AIA Minnesota. 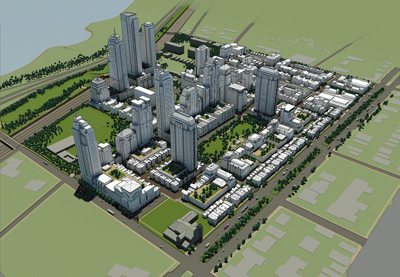 The article states that the design concept is a result of Wright's plan for a town titled "Broadacre City". 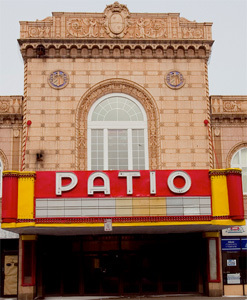 However, the aesthetic of the station most closely resembles his Beth Sholom Synagogue in Elkins Park, Pennsylvania. Given that both structures were completed in the late 1950's, both structures give a glipse into Wright's increasingly Modern sensibility associated with his Usonian period. For more information on the Frank Lloyd Wright Symposium, download the brochure here. The Art Institute of Chicago, in a press release, has announced that the opening day of the Modern Wing will be May 16, 2009. The addition, designed by Renzo Piano, will allow the Art Institute to greatly expand its display of Modern and Contemporary artwork. Admission will be waived for one week following the opening which will not only welcome the new gallery space but the Nichols Bridgeway, Griffin Court and several other public and education facilities. Paired with the new installations from the museum's permanent collection will be the inaugural exhibit Cy Twombly: The Natural World, Selected Works 2001-2007. The mammoth 264,000 square foot, three story addition will feature works from European artists after 1900 on the top level. The second floor will house the permanent collections of Contemporary artists such as Andy Warhol, Gerhard Richter, and others. Additional second floor space will be given to Institutes collection of architecture and design. On the lowest floor will be photography exhibition spaces as well as a space for new media works, referred to as a "black box". As Piano's brilliant building begins to be finished, check back here for images and information. The University of Chicago Law School's Eero Saarinen designed Laird Bell Quadrangle got a laudatory write up by Blair Kamin following the completion of the renovation and expansion of the complex. While life in the Soviet Union was difficult for the general populous, it was anything but for the architects of the defunct Communist state. 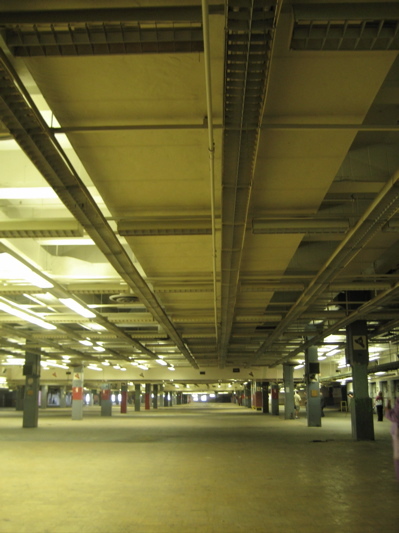 Massive infrastructure and building projects kept commissions and creativity flowing. The Chicago Architecture Foundation, on July 10th, opened a photograph exhibit displaying some of the building projects that shaped the Modernist aesthetic. Unlike the balance of Soviet architecture, the exhibit seeks to highlight the particular building projects that were constructed based upon a set of ideals, rather than the utilitarian needs of housing as many people as quickly as possible. Analyzed within the spirit of it's age, the buildings stand as heros to the glory of industry and a refute to the stylized, stagnant decoration that turn of the century architects associated with old class structures and formal society. The exhibit will run to October 3rd and is located at the CAF, John Buck Lecture Hall Gallery. To visit the CAF webpage about this exhibit, click here. As the towers along Roosevelt Road rise, appending the South Loop to the Chicago skyline, the focal point may now be in place. One Museum Park (OMP) of the Central Station development is not yet completed but has already anchored itself in postcard pictures and panoramas for years to come. Designed by Chicago firm Papageorge/Haymes, the building is a clever response to the problem of design a building that is shaped by concept but maintaining economic viability. For this lakefront building, economic viability can be summed up in one word, views. Last Tuesday, Logan Square residents met with Alderman Manny Flores and city planning officials to discuss a draft of the Milwaukee Avenue Corridor Plan, the Chicago Journal reports. Some resident organizations acted surprised to here that the planned called for building densely surrounding the transportation nodes that exist in the First Ward neighborhood. Sally Hamann of the Greater Goethe Neighborhood Association apparently never equated density with building height. However, Alderman Flores supports a more intense use of the land as a "green" building practice. He asks, rhetorically, "Are we going to commit to sustainability? If we are going to do it, we have to commit and not be afraid of it." The plan emerged from multi-year effort from outside consultants and community members alike. Public meetings and design sessions yielded the following report ,accessible from the Center for Neighborhood Technology website. As the Logan Square area continues to emerge several more planning documents are sure to be crafted. A previous plan focuses on maintaining and developing the open areas on the northwest side. The Joffrey Ballet is in the process of moving into a beautiful new home at State and Randolph. The soaring steel and glass building, a Smithfield Properties development originally named MoMo (short for Modern Momentum), is now officially called the Joffrey Tower. Still, “momentum” remains a great word to describe this move: The new headquarters will provide the Joffrey with plenty of room to continue recruiting, training, and developing as a company. 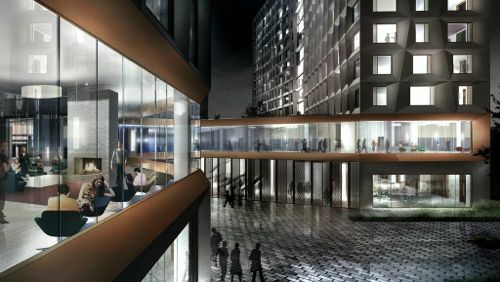 The space features offices, a street-level box office, a black-box theatre, and six airy dance studios where rehearsing ballet dancers will be visible from the street below. These facilities will also contribute to a more unified organization: For years, the administration and performers have operated out of separate buildings, but now they will be based under the same roof. The new 54-foot high Joffrey Ballet sign, recently mounted to the side of the building, will be illuminated for the first time this evening (Monday, June 30). A grand opening celebration for the Joffrey Tower is set for September. An international archicture firm has declared Chicago the best American city for architecture and design. RMJM Hillier, the North-American branch of global firm RMJM, evaluated cities with populations of 500,000 or more and created a list of ten candidates based on criteria like architecture awards received, the prevalence of "green design," and the number of employees in creative industries. Residents of those ten cities were polled by Zogby International for their opinions on their city's public transit systems, green spaces, and encouragement of creative activities The poll results were then incorporated with the quantitative research to determine the rankings. And unlike in this poll of America's top art cities, Chicago came in first and New York second. For more information on the survey methodology and results, the Tribune architecture blog has a PDF copy of HMJM's report. As first reported by the Chicago Tribune's Blair Kamin, world class architects Zaha Hadid and Ben van Berkel will be designing temporary pavilions for the Centennial Celebration of the Chicago Plan. Continuing what is sure to be an onslaught of articles, exhibits and events celebrating the historic document, the selection of Hadid and Berkel is sure to get the architecture community excited. This will be both architects' first foray into Chicago. The exhibits, as stated in the press release from the University of Chicago, will be installed next summer and fall in Millenium Park. Few design details were released but the exhibit will incorporate video displays explaining the history of the plan and how it may shape the future. Other celebration events are in the planning stages. Currently listed on the Celebration's website, programs begin in March and revolve around commentary, recent work, and "the next 100 years." Check back here for more details on specific events as they are released. For my next few posts, I thought I would post some of the large scale urban development plans that are in their early stages. Previously, I looked at the Gateway project at Central Station. 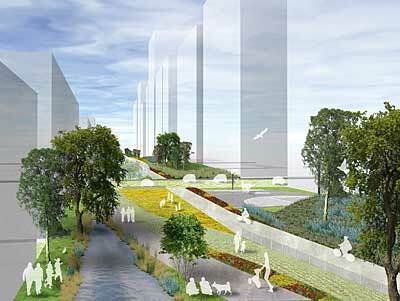 Next post, I'll look at the preliminary ideas for the South Chicago, South Works site. A quick Googling of "Lake Meadows, Chicago" will not lead to much information regarding a new urban development project. Most of what comes up looks very much like a fully occupied, long completed apartment complex. That is because it is. Property managers and developers, Draper and Kramer, is seeking to raze the entire complex roughly located at 35th & Cottage Grove. As one might expect, the residents are not thrilled. 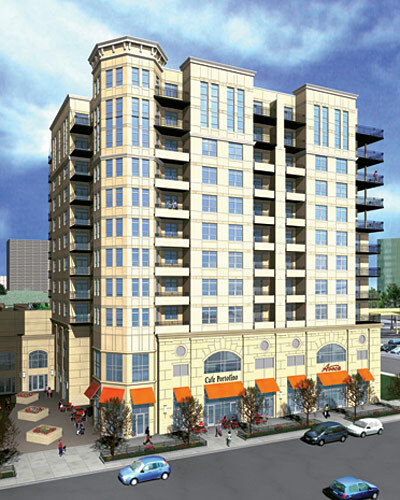 Below, conceptual rendering of the proposed redevelopment. The Art Institute's Modern Wing isn't slated to open until next year, but Blair Kamin got an exclusive walkthrough with the building's designer: Renzo Piano. By the way, I really want those blue foam mock-ups of the Brancusi sculptures. Architect Adrian Smith and Gordon Gill have been quietly drumming up support for what they consider the last missing element to Daniel Burnham's famous Chicago Plan, the Chicago Tribune reports. 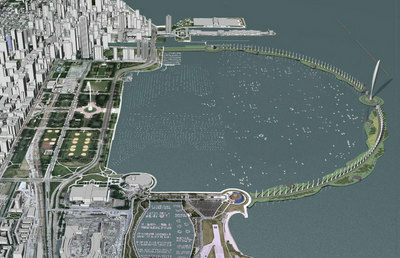 Burnham's plan called for the creation of a land bridge connecting the two major peninsular elements of the shoreline, Navy Pier and Museum Campus. 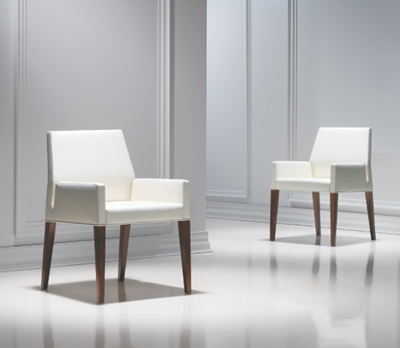 Smith and Gill have take the century old idea and redesigned it in the spirit of contemporary design and construction. Formulated to be an "Eco-Bridge" the project would allow people the ability to walk out into the lake and have a head-on view of the skyline. In addition, an observation tower would promise to create one of the most scenic vantage points in any city. Making the development ecologically beneficial, the project would provide vegetative habitats for lake fish and a series of wind turbines to help generate electricity. The project is certainly in its speculative stages right now but could become a real possibility if the Chicago Olympic Committee is looking for a dynamic way to improve upon its bid. The International Olympic Committee criticized Chicago 2016 for not proposing measures that would leave a significant legacy. An environmentally sustainable, sure to be world-wide tourist attraction that harkens back the city's infancy should put the bid over the edge. As Architect Smith states, "Now all we need is a billion dollars." I can't tell you how many times I've said that about a project! For my next few posts, I thought I would post some of the large scale urban development plans that are in their early stages. Next post, the redevelopment of Lake Meadows. Think the development in the South Loop can't get more intense? Think again. In a recent update to his book, Central Station: Realizing a Vision, visionary developer Gerald Fogelson details what the future holds for "Chicago's most successful lakefront development." In addition to completing the street wall of towers along Roosevelt Road, between Michigan Avenue and Indiana Avenue, Fogelson explains early concepts for the remaining "land" in the Central Station area. Why the "land" in quotes? Because the Gateway development would be built entirely on air rights. Located over the railroad tracks, from Roosevelt Road to 18th Street, approximately 12 towers will be constructed consisting of 5,000 new residences or hotel rooms, 500,000 sq.ft. 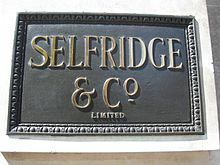 of retail, and 2 million square feet of office space. The approximate total cost of the development is $4 billion. View look north showing the Olympic venues on Northerly Island, the pedestrian bridge, and the Olympic Village towards the lower left of the image. The Daily Northwestern is reporting that Laurence Booth will be the university's first "Distinguished Architect in Residence" as the school seeks to establish its new undergraduate architecture program. In addition to Booth, several other current NU professors will offer classes in architecture history, design, and engineering. The new program will be under the auspices of the McCormick School of Engineering and Applied Science as further detailed in the school's magazine. 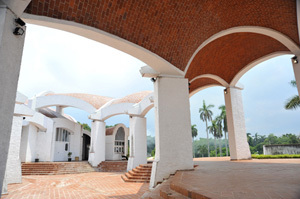 Demand for an architecture program was the main motivator for the university. The chair of the engineering school's advisory board, Richard Halpern explains, "Very often we see good prospective students, who we’d like to have come here, but they’d like an architectural component. We think we may have lost some students because we didn’t offer such a program." Halpern's involvement with the program extends beyond advisory to benefactor. As cofounder of the construction consulting firm RISE International, Halpern and his wife Madeline generously donated to help jump-start this field of study. There is no word yet as to whether Northwestern will seek NAAB accreditation (National Architecture Accreditation Board) or if the ultimate goal of the program is to offer the Master of Architecture degree. The current goal of the program will be to prepare architecture students to continue their education elsewhere at the graduate level, to attain the Master's degree necessary for licensure. Tapping Booth (who, somewhat ironically, is at the center of controversy in Evanston for the planned tower at Fountain Square) as a resource almost immediately helps give the program some legitimacy among the area's other prolific architecture schools. Hopefully, the program at Northwestern will flourish, increasing Chicago as a destination, not only to view great works of architecture, but for the education of an architect, as well. Green Parking Garage? Healthy Cigarette? 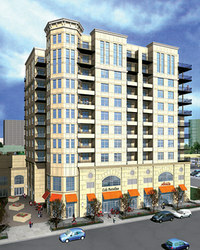 Chicago developer Al Friedman is planning to construct a 900-stall parking garage at Clark and Kinze, Crain's reports. Departing from the pattern of the typical gray, derelict structure, this garage implements design details such as backlit glazing and, ironically enough, sustainable building practices. Mr. Friedman expounds, "Usually a garage is a staid, ordinary structure. We didn't want that. We didn't want a garage that looked like a garage...At the same time we’re trying to acknowledge that the car is a central part of society. A garage is the antithesis of 'green' so we asked 'How can we make it as green as possible?' 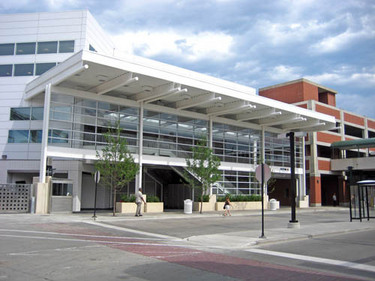 We wanted to blend aesthetics and still let people know it's a public parking garage." As part of its green features, the garage will utilize natural ventilation, electricity generating wind turbines, electric car plug-in stations, a bike locker room and a green roof. As Merger David Schalliol listed yesterday, the Michigan Avenue Street wall has been added to the National Trust for Historic Presevation’s 11 Most Endangered Places. The University of Chicago unveiled the design for an addition to the to the Joseph Regenstein Library Monday. Imagined by Helmut Jahn, the library is almost entirely submerged into the ground except for a hemisphere of glass. The addition, set to be completed in 2010, will possess a high-density, automated book storage and retrieval system allowing the university to finally maintain their entire collection on campus. In addition to the new building project, the University of Chicago will also be participating in the Google Book Search program to help digitize selected volumes. The building will cost an estimated $80 milion, of which Morningstar Inc. CEO and wife, Joe and Rika Mansueto are donating $25 million. "On Thursday, May 15th, Richard Rogers, 2007 Pritzker Prize Laureate will be speaking at the Art Institute of Chicago. Richard Rogers, of Rogers Stirk Harbour + Partners, has had a long, distinguished, and influential career in architecture. He trained as an architect at the Architectural Association School in London and then at Yale as a Fulbright Scholar. The Centre Georges Pompidou in Paris (1971-77), which he designed in partnership with Renzo Piano, brought him considerable notoriety due to its groundbreaking design which took the interior structure, pedestrian circulation, and mechanical systems¬--normally housed on the inside of a building--and placed them on the outside, freeing up internal space for exhibition galleries. It is indicative of a style that, in the architect's words, embraces "buildings...which are what we call legible-you can read how the building is put together." Although the site has been down every time I visited it, for more info and to register go here. Even though the $170 million dollar renovation will not be completed until later this year, Looptopians will get a chance to catch a sneek preview of the Palmer House Hilton this Friday, Crain's reports. The hotel, located between Wabash and State on Monroe, will be hosting events from 10pm until 5am. The Palmer House Hilton will be the second major hotel renovation to complete this year, and like the Blackstone Hotel, the designers have intended to give the building a "contemporary" update. At the Blackstone this meant stupendously restoring all the historic design elements of the walls and ceilings and then adding, less stupendously, modern carpet designs. Hopefully, the designers exercise some restraint with the common areas to retain their fidelity to the original and use the individual rooms as their opportunity to show some design flair. Either way, those rooms will be difficult to come by as hotel operators are expecting bookings to be exceptional for the pseudo "white night" celebration. 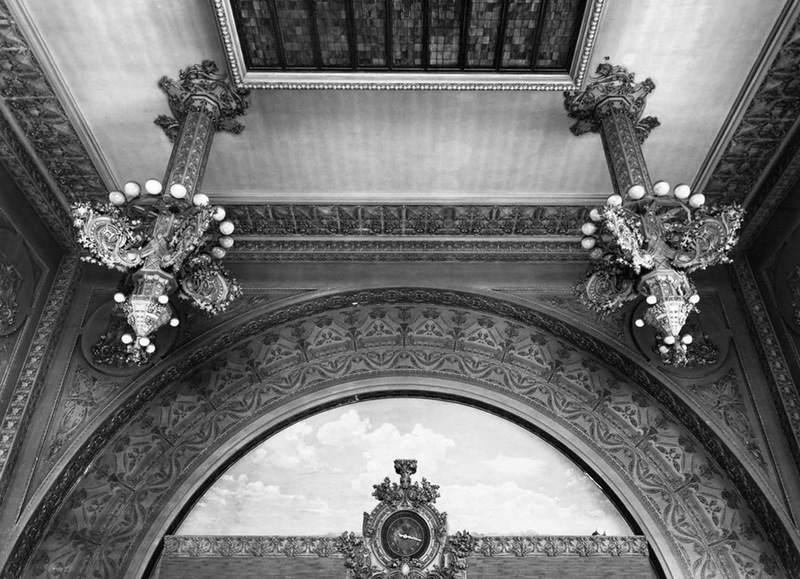 Back in the good old days of architecture, buildings used to be breathtakingly ornamented. 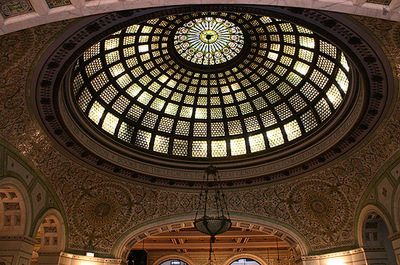 Effort is currently underway to restore the impressive Tiffany Glass dome at the Chicago Cultural Center. If you stop by on May 21st at 6 p.m., the project team from Evanston will be there to discuss the technical and historical details of the project (call 312.744.6630 for more information). Currently, the dome can be viewed from the perimeter of the room while the restoration is underway. In addition, several of the glass pieces have been replaced with temporary plastic panels. The project is extraordinary for several reasons. Perhaps most significantly, the restoration will once again allow natural light to illuminate the ornate 'jewels' inserted in the panes. 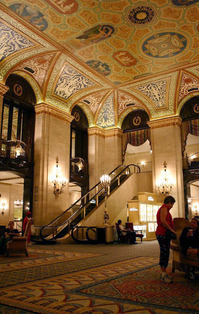 It is increasingly rare to find a Tiffany glass ceiling of this size that has not been encased and artificially lit. The metal frame will also be polished and refinished to insure that the whole ceiling sparkles radiantly. The restoration will be completed in late June. Whenever a new urban space is proposed centered around an example from Rome, one tends to nod emphatically or roll your eyes disgustedly. Unfortunately, the later tends to occur more frequently. Rome is certainly a treasure trove of lessons in urban form and after 2000 years of allowing other cities to catch up, still possesses some of the most interesting public spaces, anywhere. However, when a Roman element is to be grafted on to another city’s body, care needs to be taken that the element’s recipient doesn’t reject the implant. Top notch land use professionals from the Chicago Chapter of the Urban Land Institute joined with other city organizations such as, the Chicago Loop Alliance and the Department of Planning to propose solutions to enhance the portion of North Michigan Avenue between the Chicago River and Randolph Street. ...must have hired Mies van der Rohe. The Chicago Architecture Foundation has just announced tickets for a comprehensive tour of of Mies's work in the Chicago area. The tour culminates at the iconic Farnsworth House in Plano, Illinois. Throughout the seven hour tour, you will be taken on a virtual time-line of Modern masterpieces. The tour will be guided by CAF docents whom, from personal experience, are always exceptionally informative. Each tour starts at 9:30 a.m. and they have dates on Thursdays and Sundays through October. Super-architecture sleuth, Blair Kamin, wrote an article in today's Tribune argues that his own company may have skirted city permit requirements to install a yellow CBOE sign on a protected portion of Wrigley Field's brick wall. The Tribune Company is arguing that the sign is in fact "a sticker" and is an alteration too insignificant to warrant city review. As a result, the city is now investigating whether or not the Cubs completed work without proper permit authority. The most ridiculous outcome of this article is not that city hall will now spend time figuring out whether or not the Tribune Company violated any city ordinances; it is that this article was even written. Certainly there has to be a more intriguing architectural topic that a 2 foot by 3 foot sign on a brick wall. Somewhere in the French Riviera, famed Modern architect Le Corbusier is turning in his grave. As the Chicago Housing Authority is undergoing its Plan for Transformation, the Dearborn Homes are being used as one of their “relocation resources." To make the experience more palpable for displaced Cabrini-Green and Robert Taylor residents, renovations are currently taking place to the 68 year old buildings at 2960 South Federal.